For many stars, maintaining fame and popularity help increase their commercial value. Recently, China Business Network <第一財經周刊> released a list of the top 100 stars with the most commercial value in 2018 based on five criteria: professionalism, endorsement, commercial influence, exposure and social influence. 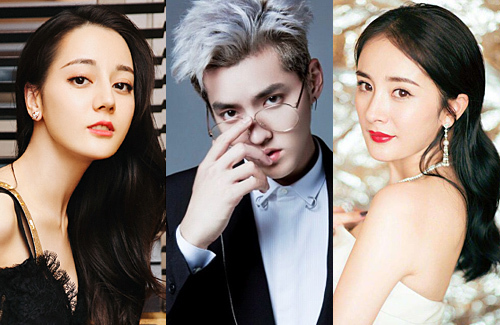 Included in the list are a number of Hong Kong stars such as Angelababy, G.E.M, Eason Chan (陳奕迅), Carina Lau (劉嘉玲), Cherie Ying (應采兒), Louis Koo (古天樂), and Shawn Yue (余文樂). Notably, William Chan (陳偉霆) is the only Hong Kong star ranked in the top 10 this year for his appearance in two films and two dramas, hosting numerous variety shows and appearing in nearing 30 advertising endorsements. Other notable stars who appeared on the list include Faye Wong (王菲) and Shu Qi (舒淇). In third place is Mainland Chinese actress, Dilraba Dilmurat <迪麗熱巴>. Appearing in many popular dramas and countless endorsements, it is no surprise the Dilireba ranked high in the list. The future is bright for the 26-year-old actress who won countless awards, including being the first actress born after the 1990s to be a recipient of China Golden Eagle Goddess Award while being the youngest to simultaneously win the Most Popular Actress Award and Audience Choice Award. Kris Wu (吳亦凡) is in second place. Kris’s talent was under question when he appeared as a mentor in the reality show The Rap of China <中國有說唱>. In addition, when Kris’ new album shot to the top of the U.S. iTunes list in November of this year, it was suspected that his popularity was manipulated by fans, but this was cleared up later. However, the controversies appear to not have affected his commercial value. Finally, the honor for being the star with the most commercial value is none other than Yang Mi (楊冪), who shot from third place last year. Despite Yang Mi starring in only two dramas and one film this year, her projects have been highly successful. Whether the headlines are positive or negative, ranging from plastic surgery speculations, criticism for acting, and most recently her divorce with Hawick Lau (劉愷威), Yang Mi has managed to stay relevant in the highly competitive industry. @sunnysun It’s considered a low amount for Yang Mi (and some other “workaholic” mainland stars). At her peak (years ago) Yang Mi was working on 10+ projects a year, and she would routinely jump between multiple different sets at the same time (max I think was 5 at once, although back then she obviously wasn’t the lead in all of them). In recent years she’s decreased her workload considerably, generally only working on 1 drama + 1 movie a year, which is definitely considered lower output. what happened to poor fan bing bing? she just completely disappeared. @littlefish actually, in 2017 Yang Mi was in 3rd place and FBB was in 4th place. FBB would’ve been top again if it wasn’t for her taxes and yeah I’m surprised YM and diliraba is in top 3 Ik they’re insanely famous but aren’t all theirs works and acting skills rated badly? @llwy12 True their commercials and other activities do get lots of money. Just hope that these famous actors will try to improve their acting skills too. @snowy I didn’t know about that but Ik Eternal Love blew up last year. The thing I’m talking about is acting skills YM to me is a hit or miss like she was good in EL but then in her last two Interpreter and Fuyao was mediocre. Diliraba is a really sweet and pretty girl but we all know she ain’t that great of an actress miles behind YM so I’m surprised she’s making that much of money. @littlefish what’s wrong with kris wu? He’s not just an actor and he’s also singer and a former member of EXO. Being in the list is an accomplishment nonetheless. And btw the list said nothing about being good actors. It’s the most BANKABLE list for goodness sake. @huppertspuppet who said that the list is about acting skills? @huppertspuppet she really needs to improve on her acting skills before taking on another lead role. @huppertspuppet she is pretty but it’s thanks to plastic surgery and true so many celebs with no acting or mediocre skills keep taking on the lead role their fans will praise them even if they just drink some water. Yang Mi’s works and acting skill are not badly rated. She has improved alot and she’s a quite decent actress. Her works are also not bad, some are better than most of chinese productions. You should give them a try. Those list are based on 5 categories which are professionalism, endorsement, commercial influence, exposure and social influence. Exposure is only 20% of all. FBB was among top 5 last year but she’s noticeably absent from top 100 this year. I am not a fan of Yang Mi. I find her acting to be so-so only, nothing spectacular, Her acting skills and looks are not any better than Zhang Ziyi. I personally don’t find her pretty. @khuekhueloves I am not YM’s hater. I just cannot understand how a mum can spend only 37 days with her innocent kid in 3 years. It shows the condition of her heart. I don’t find YM’s acting to be as good as Zhang Ziyi but amazingly she is so popular and rich. But rich at the expense of her kid’s time with her. @lovepeace123 i know you probably have good intentions when you question a child’s welfare from lack of mother’s supervision. but frankly i think it’s kinda unfair & misguided. i don’t think it’s WHO raises the children that matters, but HOW. hawick doesn’t see his daughter significantly more than YM, just a bit more. neither parents take full responsibility for their daughter. so that blame should go both ways. in addition, their daughter is being raised by loving grandparents who adore her. what’s so terrible about that? I don’t really understand why a mother have to slow down or even sacrifice her career for her baby. I believe that a mother spends less time with her child does not mean she not love her child (and we don’t even know if “Yang Mi only spent 37 days with her child” is true or not). I’m an only child, both my parents love me and love each other very much. When I was around 2 years old, my mom went to study aboard for 3 or 4 years, she chose to go and my dad respect her choice. I did not feel lack of love from my mother during my childhood, though I only got to be with her several days a year and I grew up just fine. Yang Mi and her child could be like my mom and me.